Another element of football’s Gameday that basketball’s version has failed to capture is the sizzling on-set chemistry of the crew. I’ll hazard a guess that even if you aren’t a regular watcher of college football on Saturdays, you are vitally aware of Gameday’s signature moment. College football does not kick off on Saturday until Lee Corso has selected his headgear, period. It’s a simple moment that delights fans across the country every single time, and succinctly explains why the show is so popular – while viewers appreciate the astute weekly analysis, they also truly like Corso, Herby, Fowler and Dez – as well as their obvious chemistry. The college basketball crew has been a bit of a revolving door over the years, and in what is a bit of a chicken or the egg dilemma, ESPN has failed to find a combination that even begins to replicate the charisma of the football crew. 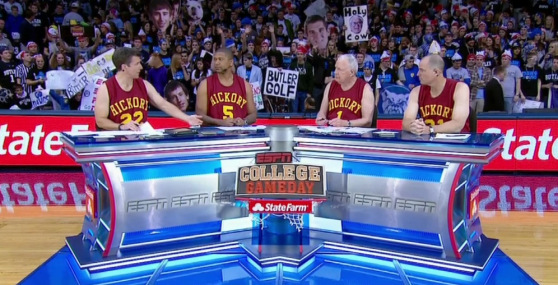 The individual pieces are far from from a disaster; Rece Davis is a solid host, Jay Bilas is Jay Bilas, and even Digger Phelps has some appeal as a Corso-type. Hubert Davis was a tolerable wingman for half a decade (before taking his enthusiasm to the UNC sideline), but the additions of Bob Knight (2008-12) and Jalen Rose (last year) never really seemed to fit. Most notably, Rose’s work at the NBA level seems to have left him at a bit of a knowledge deficit for the college game, but somehow that never seemed to prevent him from disagreeing with many of Bilas’ points. That relationship in particular felt a bit clumsy a season ago, and there are no indications that Rose won’t be back on set for the upcoming season. I can’t claim to have the perfect solution to this one – chemistry is difficult to predict, but alternatives like Dan Dakich and Sean Farnham sound a lot better to me than another year of Rose on set. Talk of improvements and comparisons to its forefather aside, college basketball’s Gameday is a staple of every January and Februrary hoops weekend. A morning check-in with Davis and company whets the appetite for the afternoon slate ahead, and the evening hour of banter both recaps the day that was and looks forward to the prime time match-up still to come. Don’t worry though – no need for you to wait on the Gameday crew to look forward to these nine games – that exercise can begin right now. This entry was posted on Thursday, August 15th, 2013 at 11:15 am by BHayes	and is filed under commentary, media matters. Tagged: bob knight, college gameday, digger phelps, duke, gonzaga, hubert davis, jalen rose, jay bilas, kansas, la salle, louisville, memphis, oklahoma state, rece davis, syracuse, temple, uconn, unc. You can follow any responses to this entry through the RSS 2.0 feed. You can leave a response, or trackback from your own site.